Recovery: a second thought. | Helping the best to get better! Whereas many books have been written about training, very few books have been written about recovery. As we know recovery is an essential part of training, it takes place in the period of time after the actual workout. It consists of the physiological and biochemical processes that help the athlete to rebuild the structures which are damaged and to replenish the fuels that have been used during the workout. Through the intelligent system of feedforward, the organism anticipating another confrontation with the same training stressors in the future, rebuilds and replenishes a little bit more than previously present. This process repeated over time, leads to the adaptation we are looking for e.g. hypertrophy of muscle tissue. This is what we call supercompensation. Recovery is mainly an autonomic process; we automatically recover from a physical load e.g. a workout or competition. The different physiological systems that are used during the workout do not all supercompensate at the same time. We call this the heterosynchrony of supercompensation. Some processes recover very fast, in minutes or a few hours, whereas other processes need many hours or even days to supercompensate. There is a strong tendency to speed up the recovery of an athlete. In itself this is not a bad idea, an athlete who works out all the time and challenges the same physiological structures and systems without adequate recovery, runs the risk of depletion, overtraining or overload injuries. In this view it is logical to speed up recovery and supercompensation. nutrition and supplementation: glycogen, creatine, etc. physical measures: massages, ultrasound, cryotherapy, heat therapy, vibration, etc. psychological measures: autogenic training, visualisation, biofeedback, etc. alternative/complementary measures: aromatherapy, acupuncture, etc. But here is the issue to think about. A lot of recovery methods work well, because they slow down or block the physiological/biochemical cascade of events happening in the body. But this is exactly the effect of training that we wanted to accomplish in order to get an adaptation!! Does this sound too abstract? suppose your 400 meter runners are doing high-intensity tempo running and produce a lot of lactic acid. Question: do you want them to jog down after each run or after the workout? Or should they squat down to hold the lactic acid in the muscles longer? This last option may sound silly, unless you start thinking about what you want to accomplish with these runs. You want the muscle to adapt to the high level of lactic acid, but therefore you need to expose the muscles to lactic acid. The effect of this is that the muscle will increase the level of intra-muscular buffer substances, that neutralize the lactic acid where it is produced. Jogging will improve the circulation and flush away the lactic acid faster, but is this really what you want, because you are taking away the necessary adaptation to lactic acid exposure! The longer the muscles “soak” in lactic acid, the better the response of the muscle and the better the training effect. The highest level of lactic acid in the blood is seen 1-2 minutes after the run anyway. suppose your athletes did en explosive training with lots of plyometrics. In plyometric work, part of the adaptation is the change in muscle tone and recruitment based on the input from muscle spindles (positive) and Golgi-tendon organ (negative) on muscle contraction. Question: do you want your athletes to stretch the used muscle groups for recovery or leave them alone? Stretching produces a tremendous amount of neural information which results in a lower muscle tone. Stretching changes the total input in the spinal cord and central nervous system. But in the opposite direction of the plyometrics! Just think about it. suppose your athletes did a hard workout on the pitch and they want to step into the ice bath to prevent them from being sore the next workout. Question: will you let them? Remember the old saying no pain, no gain? They were right! The pain comes from the cascade of inflammatory processes that the body produces in order to repair the damaged tissue. Cryotherapy may indeed block that process, but therefore also limit the full repair and adaptation of the tissue through anabolic processes! Even stronger we find this concept expressed in the taking of NSAID anti-inflammatories that also block the adaptation processes. The ultimate expression of this idea comes from the use of cortison injections for inflammation. Yes, they do a great job in stopping the painful inflammation completely, but already after a few injections the risk of muscle or tendon ruptures increases tremendously! These injections weaken the affected tissue, due to the total block of anabolic repair processes and stimulation of the catabolic processes. In recovery before the next training session (1) I am primarily interested in getting the maximum training effect for the long term adaptation, with as much recovery as needed for the next high-quality workout. In other words, I do not care that much about a little soreness or fatigue. In recovery before an important competition (2) e.g. before the finals of a Grand Slam or Olympic final, I am not that much interested in having an maximum training effect from the last workout or competition round for the long term. No, now I am very interested in ensuring the optimal conditions for a perfect performance the next day, that means minimizing limitations from fatigue, pain or soreness for the short term. Summing up: in this case I do care about, pain, soreness and fatigue and will use all possible recovery methods that we have. So don’t get me wrong I will still make a choice from all the recovery measures at my disposition even after a work-out, but I always try to find the balance between the short term effect of recovery which is ensuring a quality workout tomorrow and the long term effect of recovery which is ensuring an optimal training effect by not limiting the relevant adaptation processes. 12 Responses to Recovery: a second thought. Another great post Henk, totally agree. Altough with regard to nutritional recovery do you think that taking supplements which increase protein synthesis are vital, as the naturally signalling is still occuring but at a higher rate thus not ‘blunting’ the training effect? Furthermore, I know this wasn’t the topic of your post but with regard to things like stretching then, obviously they are a necessity to some athletes programme, when would be the best time to stretch. Yes, you are right. I distinguish between supportive recovery measures (e.g. replenishment of fuel and fluid that got lost during training), and suppressive recovery measures e.g anti-inflammatories) So supportive measures like proteins do not blunt a recovery response, but rather enhance it! Well, stretching before the work is clearly proven to decrease explosive performance, I would stretch, only the muscle groups that are proven to be performance limitation (in ROM), mainly in the transition period or general preparation period and for the rest of the season, as far away as possible (in time) from explosive workouts e.g. resting days, so to limit the possible interference with explosive high-quality work. Excellent and intriguing article. Related to nutrition there is much discussion in both the scientific community and among coaches and athletes who compete in endurance events (>90 min) about the value of commencing selected training sessions with low muscle glycogen availability (note you can also manipulate exogenous carbohydrate availability by fasting, withholding carbohydrate before and during training etc). Training low and competing high. The timing of application of specific recovery methods is also very important as the effects are very different immediately post training, 24hrs post, 48hrs etc. Here are some more thoughts: first a question: are we looking for improving performance or faster recovery? The scale is different. A nutritional supplement that increases performance (dependent on what performance kind of performance and on what level of course) with 2% is great, in the sprint it could be the difference between winning a gold medal or not making it to the finals. But a nutritional supplement that speeds up recovery by 2% in itself is quite useless. It just means that the athlete could start his/her workout 30 minutes earlier, after yesterday’s workout. 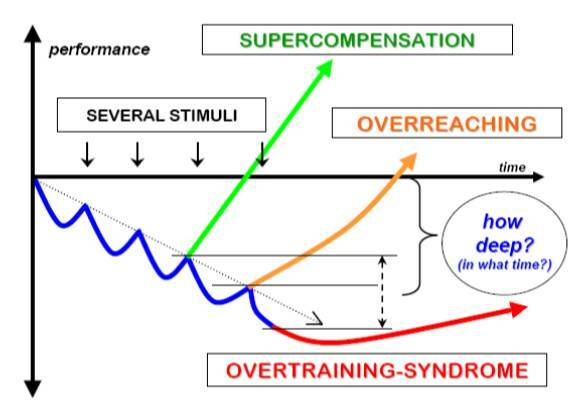 It does not imply that my supercompensation response is higher, nor that other physiological systems that might be the limiting factor in recovery have also recovered faster. Yes, I think that by starting with lower glycogen levels you have to tap deeper into your metabolic resources, but that could also be accomplished by training harder. And what would be the implication for the recovery time and the height of the supercompenation response? Besides that we have to think about the effect on the volume and intensity, the quality of the workout. Things that work out well on the bike or treadmill in the lab might turn to be different in real life on the pitch, the track, the pool or the court. Nobody said that recovery was a simple issue and if they told you so, they were lying. I think you are greatly oversimplifying the complex molecular signaling that takes place as a result of the training session and missing some key physiological points. In your lactic acid example, a substance that generally doesn’t exist in the body to begin with, you are missing that high levels of lactate are correlative of the working effort, not causative of any adaptive responses. It is the overall cellular environment that is created primarily during the period of work, not during the period of rest, that sets off the signaling cascade that leads to adaptation. This is where the cellular homeostasis is challenged the most, squatting down to slow down the decrease in lactate levels makes no sense. If it were simply the prescence of lactate that was caused adaptive signaling to take place then all you’d need to do is inject lactate into athlete’s muscles and the same thing would be achieved. Changing the cellular environment during the periods of work may have an impact on molecular signaling, but trying to view adaptation as the the result of a level of a signal substrate like lactate is a gross oversimplication of the adaptive processes at work during training. I do not know anyone who does not, or better: is forced to, oversimplify the molecular signalling processes considering the overwhelming complexity of these processes. We can only highlight a few of them, which does not mean we shouldn’t be adressing those, even if simplfied or oversimplified. A blog is by no means a tool to be complete when writing about this aspect. The chance is we would be losing readers very fast too 😉 Which also does not mean that things written should be unaccurate or besides the point. And yes, you are right there are many more processes involved in muscle metabolism and in fatigue and adaptation. I think you are in the danger zone stating that lactid acid represented by a high level of H+ ions, is nonexistent. I feel that oustanding physiologists like Lars Hermansen, George Brooks, Jens Bangsbo, Alois Mader, Bertil Sjodin, Wildor Hollmann, Howard Knuttgen,Bertil Sjodin, Wolfgang Kindermann, Jon Medbo, Ira Jacobs, Per Tesch, Bernd Pansold, Pietro Di Prampero, Eric Newsholme, Roger Harris to mention just a few, would like to disagree. That does not make me being right, but if I am wrong, at least I am in good company. In any case, I am stuck with a few questions: where does the H+ come from, if not from lactic acid? What could be the goal of producing it then? Why do buffer substances like bicarbonate exist in the body? Why are bicarbonate and citrate used as ergogenic agents? And why do have anaerobic dominant muscle fibers(type II) fibers more intra-muscular buffers substances like carnosine and anserine? Would one be able to train anaerobic endurance (or as we used to call it lactate tolerance) without producing lactic acid or H+? And why and how does anaerobic training increase carnosine and anserine in the muscle? I doubt if injecting lactic acid into the muscle would disperse all over the muscle and all muscles enough to reach blood lactate level of over 25 mmol. I agree that the training load during the workout is the dominant fcator in creating the adaptive response, otherwise why would we be training, but apart from creating the snowball of adapative responses during the workout, dependent on what kind of workout, of course, the response does not stop immediately the moment you put the barbell down (remember post-activation-potentiation?) or when you pass the finish line. In my opinion what you do in the seconds or minutes after teh actuel exercise certainly has the potential to increase or decrease the adapative responses. Regardless, I don’t think we can even concretely say we concretely understand the full impact of the acidosis associated with the working cellular environement as there is some research that shows it may actually prevent the decrease in contractility rather than cause it. This is also supported by the fact that there is much less change in muscular pH than previously reported when body temperature is accounted for and generally poor correlation between decreased pH and contractility. When we look at the big picture of fatigue and of molecular signaling, trying to pinpoint anything on one substance or one particular cause is an oversimplification to the point that any conclusions drawn from it have little meaning. I don’t think we can truly provide answers to your questions, let alone base training recommendations on them, because we do not yet thoroughly understand the working environment of the muscular system to the point that we can separate out correlation from causation. I agree there is valuable in looking at the pieces of the puzzle, but making conclusions about what should or should not be done during rest periods based on a single marker like lactate seems a bit overly presumptuous to me. Thanks for your contribution once again and bringing up the interesting approach towards the role lactic acid. I have been working abroad last week and did not always have adequate access to Internet for an earlier reply. Yes, I read Robergs paper now almost 5 years ago now, but I also read the comments on his paper in the JAP 2008, 2010 and 2011. Where exercise physiologists from all over the world slammed each other over the head with stacks of paper accusing each other of methodological and semantic errors. An example: Marcinek wrote (JAP 108, 2010, pg. 1479-1484: “For a physiological range of pH and lactate levels in muscle achieved by moderate ischemia or exercise, lactate acidosis is a robust concept”!!?? So is Marcinek a worse physiologist than Roberg? Whom to believe? Well, it certainly did not make things easier for a simple coach like me, I do not have the qualities, time and energy to judge which exercise physiologist is more right than the other. I bet, that like always the reality is somewhere in the middle and they are seeing one part of the famous elephant only. I also fully realize than in 10, 20 or 50 years we will be looking back and smile at our current “ridiculous” ideas, that is the beauty of science, the more you learn the more you realize that we barely know anything yet. I would never ever state that fatigue or muscular fatigue could only be the result of one factor, leave alone lactic acid. But as far as I can read I also never stated that! H+ from whatever source could be one of the many reasons for muscular fatigue. In the blog, I try to talk the language of coaches, not of the happy few molecular biologists. I prefer oversimplification and making people think and even sometimes think wrongly, over needless over-complexification and heavy language, so people get lost, stop reading and don’t think at all. I agree that at the end of the day the practical implications are more important than the scientific semantics, I was merely commenting that when you’re making quite specific and atypical training recommendations, such squatting down between reps of sprints rather than using a form of active recovery or rest, then the physiological reasoning that you’re using to make such a statement should at least either have some level of solid research behind it, or spoken with some practical experience and examples of how it’s worked for you as a coach. In this case, you were making a specific suggestion that increasing the level of lactic acid in the muscle by squatting rather than resting would lead to an improved adaptive response. Whether or not the acid exists may be a matter for science to debate, but as a coach and as a practical recommendation, I simply disagree that there is anything scientifically valid that supports that idea. I would suggest it’s much more likely that there are many more important factors that result from the working cellular environment rather than the resting one. It’s much more likely that it’s simply the rate of ATP hydrolysis that’s occurring that ends up being one of the primary adaptive signals and that can’t be replicated by any means during the rest interval. If changing the rest interval by squatting down slows down recovery and results in more fatigue in the following reps and thus lower rates of ATP hydrolysis, then it’s quite possible it would impair signaling, not enhance it. In any event, I agree with you on other points of recovery, but I think making specific training recommendations based on physiology that’s not particularly well understood even by the best scientists can be a slippery slope. Do you have specific examples of where you’ve used this strategy with athletes and seen a definite improvement compared to a more traditional one of active rest? When it comes to sport performance training and sports science, the lack of intelligent conversations is really laughable. There should be WAY more. If egos can be checked and science is justified we will all get better. The athlete is the benefactor which is what we all want. I’m very glad that Joel and Henk are “debating” points and acting like gentleman who simply have differing opinions. Excellent overview (as I’ve only come to expect from this often-prescient blog). It seems that much of the problem [in the Western world] stems from 1) an inability to distinguish between recovery and supercompensation, and 2) an inability to appreciate “stress” as a positive. Once again we must turn to the Russians for applied scientific information.